While rearranging a pantry shelf recently I came across an errant bag of biscotti that had shifted off by itself, becoming the clear culprit in the current traffic jam. I opened the bag and I gave it the sniff test—a lingering scent of cardamom drifted out. On the bag I had scribbled near illegibly, ‘Ginger Cardamom’, likely lost remnants of my last biscotti du jour effort. I do that. 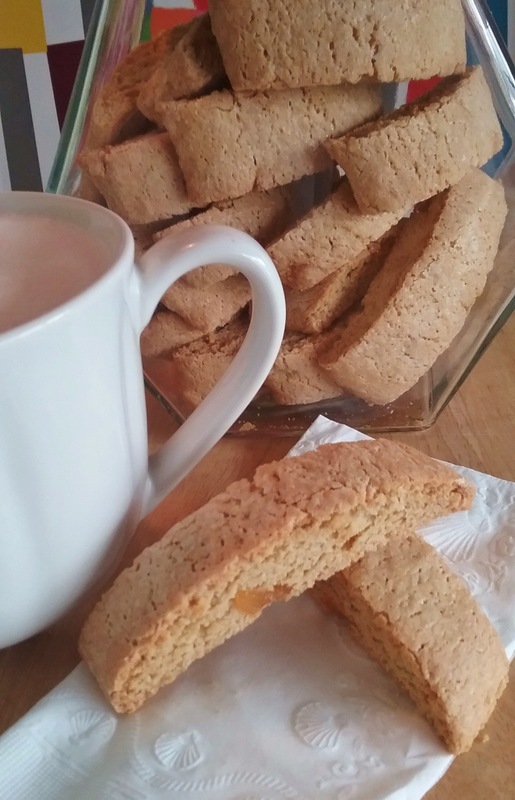 I’ll have a new favorite biscotti that I get stuck on and keep baking more of the same. Biscotti can be fickle. The dough can be temperamental and far more trouble than it is worth. The double baking which aids in its longevity creates an additional step, so let’s keep it simple. Here is my basic recipe for a tender biscotti that I change up with different additions of dried fruit, nuts, flavorings, etc. It is a very malleable dough that can be quickly mixed by hand. Ginger in any form is a reoccurring theme on this site. I adore it because it is soothing, satisfying, and spicy enough to pack a good punch. Since cardamom is seductive and supportive in its own flavor profile, these two team nicely together. My saved cooking notes on this batch indicate that I added a dash of sesame oil. I still like that notion. Call me a purist, but when it comes to nuts in biscotti, I have my moments. In the case of sesame oil, it does not compete with the lovely chewiness of the candied ginger, yet complements both the ginger and cardamom. What a nice surprise! After a month or so lost in storage, these cookies are still good enough to warrant a fresh cup of coffee and another round of biscotti for me and my friends. Preheat oven to 325-350° F. Prepare parchment or silpat lined baking sheet. Combine dry in small bowl and whisk. In a medium mixing bowl, whisk eggs through vanilla until well blended. With spatula, stir in dry ingredients just to combine. Stir in candied ginger. Scrape onto baking sheet dividing and shaping into 2-3 narrow loaves @ 1″ high and 2″ wide, keeping them about 2 ½” apart. They will spread. Bake 30 minutes, until firm but springy. Cool briefly. Using serrated knife, slice loaves into ½” diagonal slices. Lay cut side down on sheet. Bake 12 minutes. Turn slices over and bake 12-15 minutes longer, until light golden brown. Cool on rack. If desired drizzle with melted white chocolate. Store airtight at room temperature. Yield: 2-3 dozen biscotti.